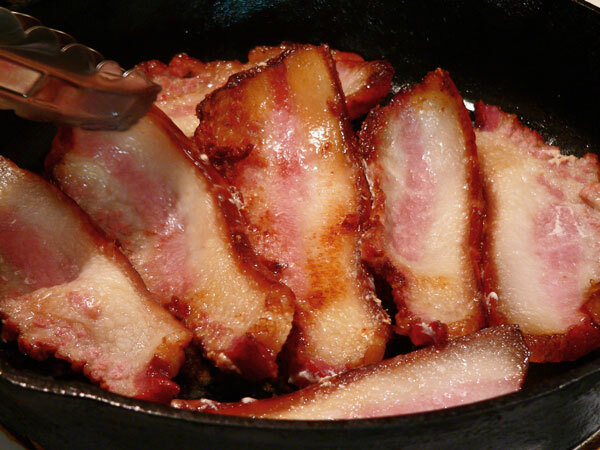 Follow step-by-step, photo illustrated instructions to fry up some good old Southern Hog Jowl. 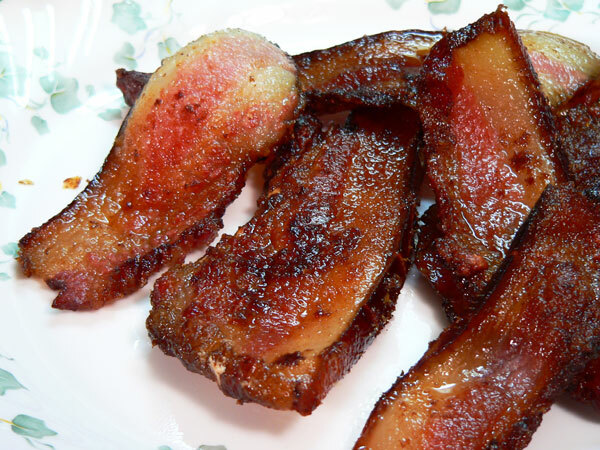 Often referred to as Pork Jowl Bacon, it’s not just for New Years Day. We’ll show you how easy it is to slice it for frying, or to use it as seasoning in lots of your favorite beans and greens side dishes. Printable recipe included. Hog Jowl is typically something you might only look for in the grocery store as you plan your New Years Day menu. It’s sad, but that’s just the way it is. I say “sad,” because it can be used all year round, but most folks don’t think about it beyond the traditional New Years Day meal. So, what exactly IS this Hog Jowl that we speak of? Well, it’s Bacon. Maybe not the typical bacon you might think of, but it’s still a type of bacon. And, it’s just as good as what you normally consider bacon to be. 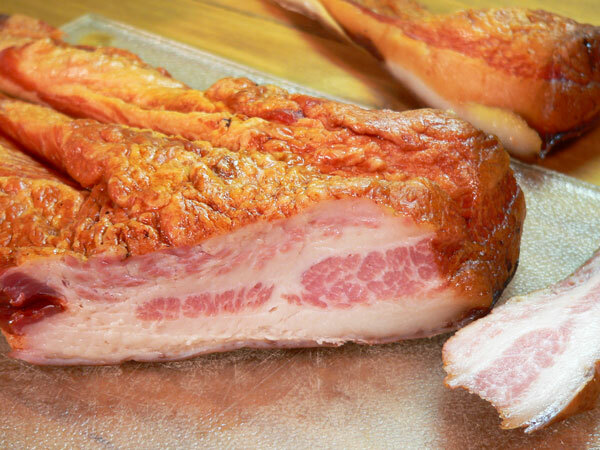 The bacon you typically purchase is made from smoked and cured pork belly. Hog Jowl Bacon comes from smoked and cured cheeks of the pig. Both have sections of fat, and sections of meat. Regular bacon though, doesn’t come with the rind, or skin, like Hog Jowl normally does. The Hog Jowl part, is more like fatback in that respect. But, we’re getting off into another section and direction all together. Let’s try to stay focused. 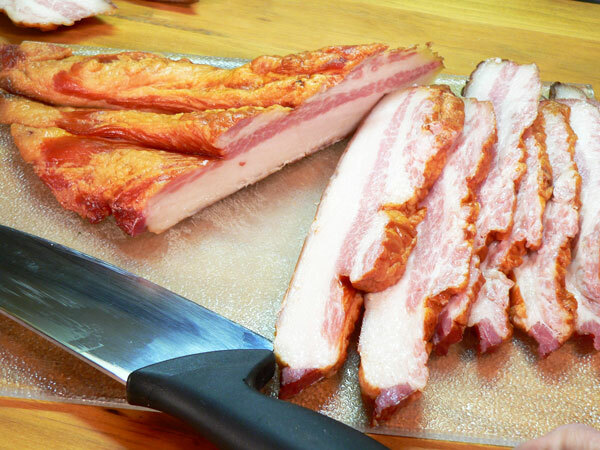 You can slice the Hog Jowl, as we’ll show you below, and fry it just like bacon. (Because it IS bacon.) You can also use it to season up Pinto Beans, Butterbeans, Black Eye Peas, or even your Collard Greens. It’s very versatile, AND it’s usually much cheaper than regular bacon. That makes me smile. Personally, I prefer to use Hog Jowl over Ham Hocks when I cook up a pot of peas or beans. There’s just a little difference in the taste of the smoked jowls that tickles my taste buds, so I try to keep some in the freezer year round. Normally, buying a section or two just as the year ends, and placing it in the freezer, will keep me in good supply for months to come. So, if you’re ready to keep the tradition going, Let’s Get Cooking! Fried Hog Jowl: You’ll need this, a Hog Jowl, smoked and cured. This is the meat side of this particular piece of Hog Jowl. It’s been fully smoked and cured and it’s ready to be sliced and fried. 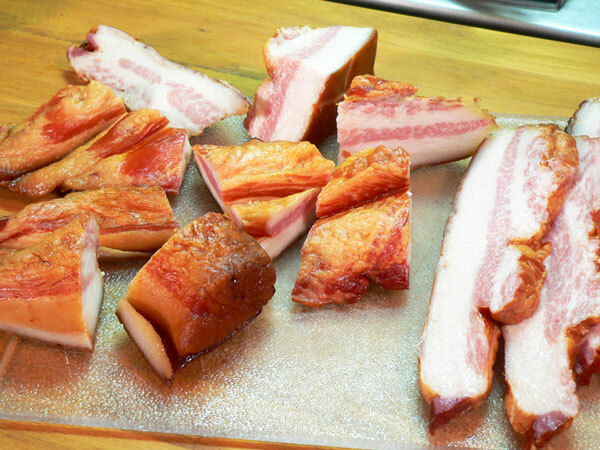 You’ll find Hog Jowl in all types of shapes and forms, large pieces and small, when you go to purchase it. It just depends on how it’s been cut and prepared by the butcher. You’ll find thin pieces and you’ll find thick pieces. Just pick out the one that suits your fancy. This is skin side up. Most of the time, Hog Jowl will come with the rind, or skin, still attached. You can leave this on, but you’ll need a good sharp knife to cut through it. I think the markings on this one is what caught my attention the most. It looks like it’s straight off the grill, but it’s just from where it was smoked and cured. It looks like bacon! 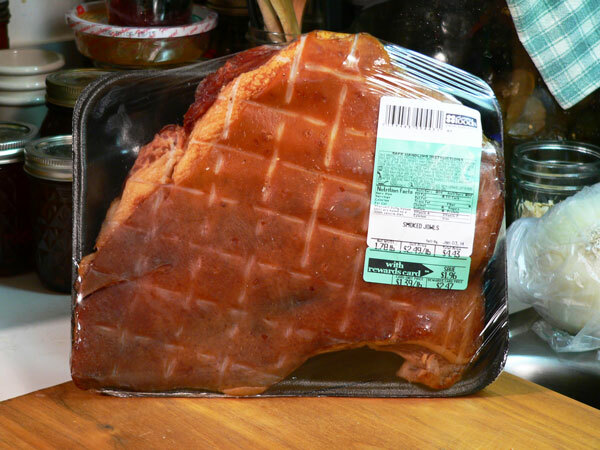 Once you slice into it, you’ll see how much it resembles bacon. You’ve got a good amount of fat, and some marbled lean meat as well. You’ll often find it labelled as Pork Jowl Bacon if it’s been smoked and cured. The neat thing about it is, you can slice it up as thin or as thick as you like. As mentioned, you’ll need a good sharp knife to slice through the skin part. It’s best to have the meat really cold, so you might want to pop it into the freezer for about 15 minutes before you try to slice it. It just make it firmer and easier to work with. Slice off enough bacon like pieces to fry up in the skillet. I like it a little thick so these pieces are a good quarter of an inch thick or more. When I got down to the thinner edge, I just cut it up into hunks. I’ll freeze these to be used later as seasoning meat when cooking up Pinto Beans, Black Eye Peas and other dishes. Because I still don’t have that food saver to vacuum seal my foods with, I start out by wrapping each piece in clear plastic wrap. Then I wrap each one of those in aluminum foil. Next, I place several pieces inside a good Ziplock bag and place them in the freezer. I did this to keep that heavy, smokey aroma from getting into my ice cubes and other food items in the freezer. I can pull one of these out of the freezer when I start to soak my Black Eye Peas overnight, then it’ll be thawed and ready to toss in the pot when I start cooking the peas the next day. I warmed up the cast iron skillet and placed the sliced pieces of the Hog Jowl inside. Cook them just below Medium heat on your stove top. You’ll need to turn them as needed so they don’t overcook in any one place. Rotating them around in the pan can help as well. Just keep an eye on them and don’t let them cook too fast and burn. Unless you like it burned, that’s your choice. Thicker slices will not crisp up like thin slices of bacon, but it will get pretty close. Cook it up as brown as you like it. When it’s done, remove it from the pan and place it on a couple of sheets of folded paper towels and let it drain a bit. Because it’s full of fat, you’ll have a good amount of grease remaining in the pan. This can be saved and used just like you would with bacon grease. It will also add good flavoring to your other dishes. Don’t pour it out, save it in a container inside the refrigerator. Yield: Varies, according to beginning weight. 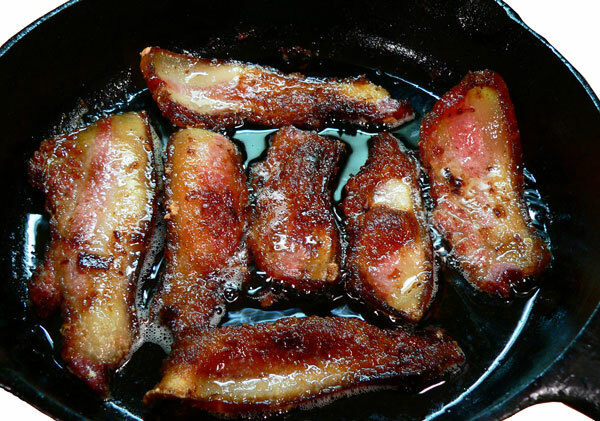 Follow step-by-step, photo illustrated instructions to fry up some good old Southern Hog Jowl. Often referred to as Pork Jowl Bacon, it’s not just for New Years Day. We’ll show you how easy it is to slice it for frying, or to use it as seasoning in lots of your favorite beans and greens side dishes. Using a sharp knife, slice the jowl into desired thickness strips, like bacon. Part of the jowl can be cut into hunks for seasoning of beans and greens. 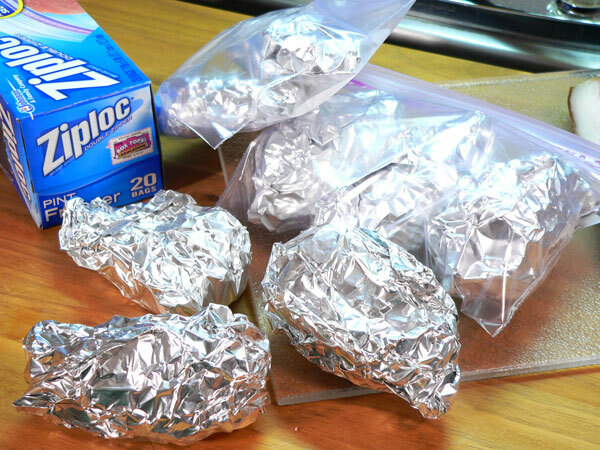 Wrap any sections for freezing in plastic wrap, then aluminum foil. 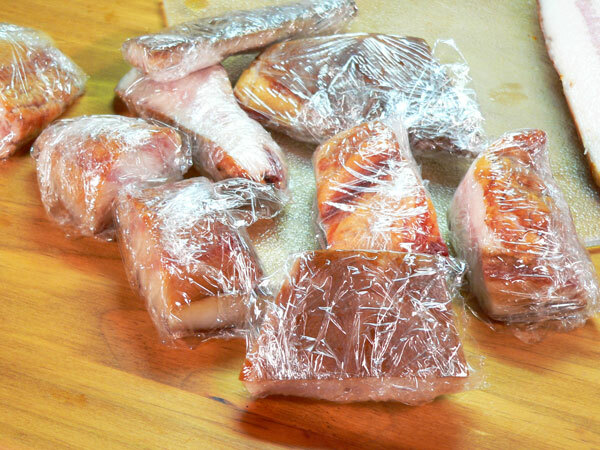 Place wrapped sections in a Ziplock type bag and place in freezer for use later. Heat a skillet to just below Medium heat on your stove top. Place the slices of jowl in the warm skillet. 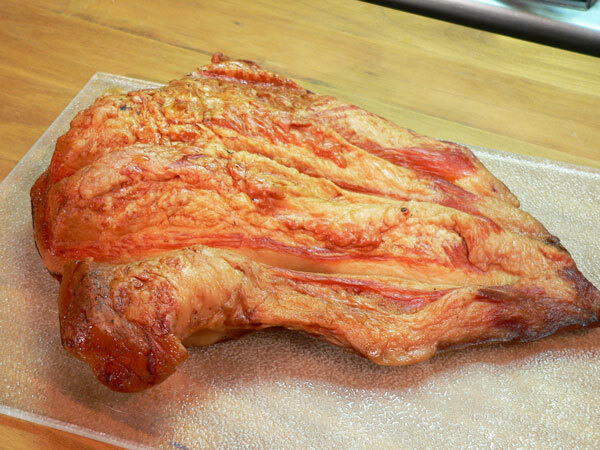 Turn jowl slices as needed, to prevent burning, and cook until fat is translucent and browned. Remove from pan, place on paper towels and drain. Save remaining grease from skillet by placing in a container and storing in refrigerator. Use leftover grease just as you would any type of bacon grease for seasoning and cooking. Serve the cooked hog jowl slices while warm. Store sections of hog jowl in the freezer to add to your next pot of beans or greens. Jowl may be frozen then thawed prior to adding to Pinto Beans, Butterbeans, Black Eye Peas, Collard Greens and more. It makes a great seasoning meat for most any type of beans and greens. Leftover grease, after cooking the hog jowl, may be used like any other bacon grease for added flavor. Your Comments: Do you serve Fried Hog Jowl as part of your traditional New Years Day menu? We’d love to hear from you and invite you to share your comments and thoughts with us in the section below. It will only take a minute or two of your time and we’d greatly appreciate your participation. Keep in mind that all comments are moderated. That just means that I personally read each and everyone of them before they are approved for our family friendly home here on the Internet. I also reply to as many comments as possible so I hope you’ll check back for my reply in just a few days. Thank you in advance for sharing your thoughts and comments with all of our readers. Sign Up For Our FREE Newsletter: While you’re here, be sure to signup for our FREE Newsletter. I try to send out a quick note after we post a new recipe, or any time anything of interest is happening around Taste of Southern. It’s just a quick reminder for you to check out our latest recipe and to keep you informed of any Giveaways, Contests or other events that we might be presenting. It’s totally FREE to signup and you can do so by entering your information in the block below or in the top right hand corner of each page. We hope you’ll never feel the need to unsubscribe, but in case you do, it’s even easier to have your name removed from our list. So, Sign Up NOW, and we’ll look forward to seeing your name on our list very soon. Thanks again. I fried them on a panini maker and had no oil splatter mess to clean up. It also cooked evenly. My mom would slice side of the rind so it will lay flat ,she also used flour. Jowl bacon ,white beans ,greens and cornbread YUM YUM ! I like to trim the hard rind off the edge of the jowl with kitchen scissors before frying. I’ve found the bacon tends to lay flatter in the pan while it is frying, plus you don’t have to eat around that hard rind. A BIG thank you for posting this. Im a yankee (I prefer misplaced southerner) and came across some jowls after having a hog butchered. Thanks to this post im off to make some jowl candy. thanks again. I have recently started cooking my fat back in the office on low heat… turns out wonderful and the skin is crunchy and very edible… I wondered if hog jowl could be cooked that way as well? My father and mother owned a small country grocery store. We had jowl bacon most of the year.For the first few years we did not have a meat cooler so therefore we could not have the Jowl Bacon all year. We saved all the grease and used in our vegetables. Nothing better to season different foods. It is a tradition to have Cabbage, Blackeye Peas and Jowl Bacon on New Years Day. Altho we had it all during the year. My mother always said it was for Healthy, Wealthy and Wise, altho I never figured which was which. Keep the grease from any bacon and use it when making popcorn – GOOD! My husband LOVES the grease drizzled over lettuce. It’s a spring time southern delicacy in our neck of the woods! Thanks to year round supplies of lettuce now, we can enjoy it year round. It sounds disgusting, I know, but even the younger generation fight over this when his Momma puts it on the table for Sunday dinner! This looks so yummy! I soaked some black-eyed peas overnight, and was looking on which cut of meat to put with it, and the hog jowl sounds like it would be good in there. The pictures are making my tummy growl! Right about the first of the year, we were shopping in our local “Food City” grocery. They had about two dozen or more packages of hog jowl bacon. The price was really hard to beat so we bought a couple packages and took them home and fried some up on the stove. It created a little mess but we loved the hog jowls. So we went back to the store and bought about ten packages because the price was really low and they had even reduced the original price. I tried to introduce the jowls to my married children but so far they haven’t seen the charm in the jowls. My daughter-in-law, though she did try them, said she didn’t want to eat anything that was so close to what a pig was eating (meaning the cheeks). And my son created a huge mess frying up a batch. But, he chose to fry them in his huge cast iron pan at a very high heat. Grease was everywhere: on the stove, on the wall, on the floor, and I think it was probably on the dog too. 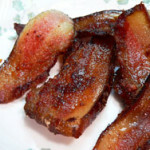 I found your site and loved the pictures of how to fry hog jowl bacon. It gave me a little more clue as to how to deal with this delicacy. I can’t wait to try some of your recipes as well. Thanks for the great website. I am glad I found your site. I found some hog jowl back in Dec, but now I can’t seem to find it now. Where I find it in my area? Charlotte,NC. Thanks. Also, I would like to mention that regular bacon gives me terrible headaches. This jowl bacon does not give me headaches. Maybe its the process of regular bacon that is not in jowl bacon. What do you think? Hi Beatrice, You should look for some independent type of grocery store in your search of hog jowl. The older type of stores that are independently owned would probably be more than likely to carry it. At the same time, you can always ask your local grocer if they can order some for you. They will usually be happy to do so, but most folks just never ask. Don’t be afraid, they would like to know you’re interested in it. You’re probably getting those headaches from some of the preservatives used these days to “cure” bacon. The process will vary somewhat from one seller to the other. Here again, one of the older country stores might have something that wouldn’t have those, so you might consider that as well. If you have BI-LO they have hog jowl… and also IGA..In fact I think most meat markets do have it this time of year… except Food Lion….You may have to ask the meat manager! My local food lion has it! Aj, you mean Charlotte ??? Joking aside, some people are sensitive to either nitrates or nitrites, giving them headaches. Back when I was still in the Army, when we worked with explosives or I was running a weapons range, I literally had to strip on the porch, or my wife would get horrific headaches. I’d then immediately toss those uniforms into the washing machine and set them to wash, wash myself up, then present myself to my family. 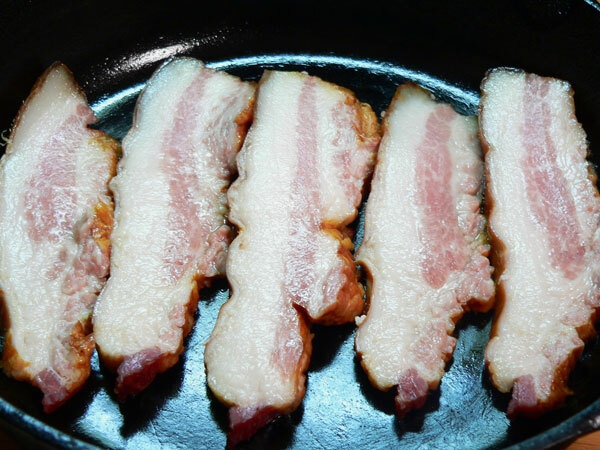 That aside, Walmart didn’t seem to carry jowl bacon up by Philly, but it’s common in NW Louisiana Walmarts already sliced and ubiquitous in every other chain and local store (the latter being an endangered species). I know you can find it in a local food lion, or where I live, which is Louisburg, at Moss foods. It’s typically a very low price and good quality. I can buy it at Food Lion in Virginia. So glad I stumbled on this post! I just picked up a package of smoked jowl at Winn-Dixie just because it looked so good, even though I hadn’t a clue what to do with it – I love pork, so I figured I’d find out, and now I have! Mom used it in spaghetti sauce and when making liver. Ugh. The rind was saved and nailed to the trees for birds in the winter. A friend had a pig butchered and processed and gave us the parts he didn’t know what to do with. We were lucky enough to get the cured jowls. Thanks for the cooking info. Hi Russell, I’m thankful Google sent you to Taste of Southern. Don’t you just love the Internet? I appreciate your comments and that you’re willing to share our site with your friends and family. That means a lot. I went all over your site and really enjoyed reading about your farm. You’ve got some great photos and the videos are just as nice. Loved the “Field Meeting” you held with your animals. I agree I remember my Grandpa would refer to it as smoked joe. I’ve loved it since he introduced me to it as a child . Another overlooked cut are the hocks, beans ain’t beans without hocks . Sometime if you have one share a good ole fashioned macaroni and tomatoes or goulash recipe with us . May God bless you yours . Hi Brad, Thank You for sharing your comments and your memories of the Hog Jowl. I think some folks are just put off by the name, but I like it myself and use it often. We used ham hocks in our Southern Collard Greens Recipe, here on Taste of Southern. I certainly agree, it makes a lot of beans taste a whole lot better. I always used country smoked hocks to season greens and peas, but then my butcher suggested shanks instead. Same thing but just a tad more lean meat. Tastes the same and gives something to shred and add back to the bowl! Aint nothing better than a hog jowl sandwich ! I have found that making 2 or 3 little slices through the fat on the fatty side helps with curling . WOW! I’m 75 and never tasted jowl bacon until a few days ago. I was looking for hocks and found this, it is so good. I’m sure my youngsters won’t try it but I’m an adventurous eater in my old age. I’m afraid this will catch on and jowl bacon will become hard to find, if people only knew how tasty it is!! Hi Linda, I’m thankful you found Taste of Southern and our How To Fry Hog Jowl recipe. I’m just wondering how you’ve gone through 75 years of life and never tried hog jowl. I’m glad you finally discovered it, and I’m in agreement with you that most people don’t know just what they’re missing. I use it a good deal for seasoning, and pretty much prefer it over the ham hocks. Hi Leigh, Thank you so much for your compliments. I’m very thankful you found Taste of Southern and that you’re enjoying the recipes. 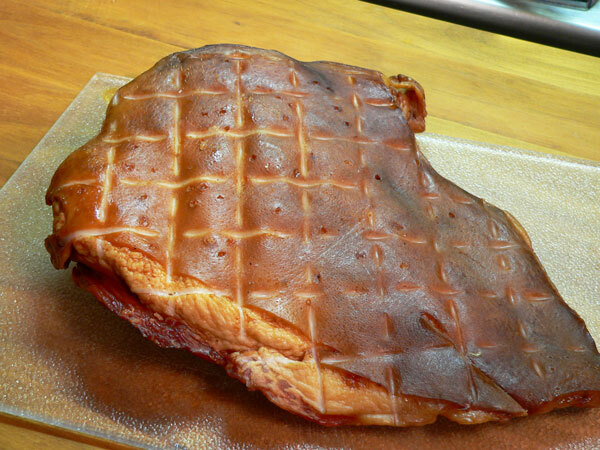 I’ve never tried the Hog Jowls with the flour on them, I’ll certainly keep that in mind and try it real soon. Learn something new everyday don’t we? Oh Steve!!! Lightly flour them and bake in the oven. Wowzers! !